The Interdisciplinary Autoimmune Summit was a continuing education meeting to help practicing physicians better treat complex autoimmune patients using a multidisciplinary, collaborative approach. Not surprisingly, both patients and their care teams are looking for better ways to identify and manage chronic disease. In sharp contrast, the annual Quantified Self meeting reflects the perspective of individual experimenters with various states of health and disease using digital tools to tweak their own health. Both meetings exemplify collaborative efforts to address complex health issues. As such, they provided essential background for my conversation with the team at MyGiHealth, a company with products targeting both clinical and individual markets. At the Interdisciplinary Autoimmune Summit, practicing physicians revealed their desire for better tools to help manage complex autoimmune cases across disciplines. “The system is a win-win, because it improves efficiency for doctors and also outcomes for patients,” noted Dr. Spiegel. 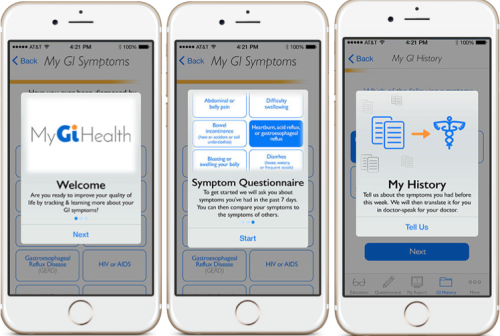 The clinical version of MyGiHealth is an automated, online mobile app that captures, assesses and interprets gastrointestinal symptoms based on a data-logic algorithm. The questions are filled out by the patient ahead of the medical appointment and the system turns the patient history data into useable clinical information that saves time at the physician’s office for face-to-face interaction. We started by focusing on making the clinical process more efficient by improving the history-taking process. Bringing together more than 5 years of research, including NIH research, we created the first MyGiHealth.” Particularly noteworthy is a study showing that the quality of these patient histories is as good as those from some of America’s best doctors. With the vast amount of information on the Internet about health-related issues –both credible and questionable – MyGiHealth’s visuals and tutorials provide a channel that keeps its users on track and away from harmful misinformation. 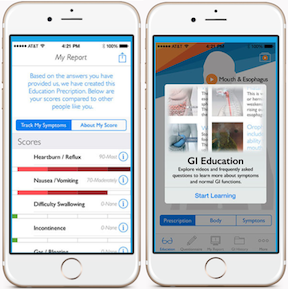 MyGiHealth is a place where people can go to assess their symptoms and receive tailored education produced by communications experts at the University of Michigan, in collaboration with expert doctors and other patients with GI problems. A user can learn about how the GI tract functions normally, what can go wrong to cause symptoms, and even get advice on simple diet, lifestyle and over-the-counter solutions that might work for their symptoms. Given my view that the autoimmune community needs collaboration from all stakeholders (see my earlier posts on the Multiple Myeloma Research Foundation and the Rare Genomics Institute), a partnership with Ironwood is another great step. Dr. William D. Chey, Professor of Medicine, Director of the GI Nutrition and Behavioral Wellness Program at University of Michigan, and MyGiHealth co-founder, commented: “For years, the scientific community has debated the causes of GI problems, blaming problems on motility (contractile activity), sensation in the GI tract, brain-gut interactions, permeability (leaky gut), inflammation and the microbiome. What is becoming increasing clear is that food sits at the crossroads between these various factors and patients’ GI symptoms. We are excited about My Nutrition Health because it will offer both laypeople and health care providers an invaluable tool to learn about food interactions and find medically responsible solutions to their problems”. “We have many ideas of how to bring MyNutritionHealth to consumers, but we will need your help in Fall 2015 to test and refine the app” stated Duncan McClaren, CEO of My Total Health. As an outspoken advocate for multidisciplinary collaboration, I view the Ironwood collaboration as an excellent next step. Likewise, after attending QS and IAS, I am personally encouraged by seeing these new collaborative efforts on behalf of the large and growing autoimmune community. Nevertheless, we still need your help. Please join me at the Stanford Medicine X workshop to brainstorm other solutions to close the gap and make the Lonely Voices of Autoimmune Disease less lonely.